The TwoUp is the larger version of the OneUp, being the lowest priced 3D printer on the planet as the TwoUp adds 75mm on both the X and Y axis in build area; the Z-axis stays the same at 125mm. At $279 for a self assembled kit, that includes everything you need,making the TwoUp an easy choice to ‘get your feet wet’ especially if you want the ability to make large objects. 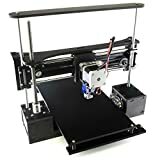 Look on any internet form and they recommend a self built printer as your first printer so you learn the ins and outs, as well as the ups and downs of 3D printing before making a bigger purchase. With theTwoUp, professional quality prints are a reality in your home which are equivalent to much more expensive machines at competitive speeds with the ability to expand the build area at a later date. Each kit includes a very reliable and forgiving extruder (which is important as a starter printer), that makes it easy to get great quality prints with minimal effort. The TwoUp is optimized for PLA printing but with the optional heated bed upgrade, ABS and Nylon printing are a breeze! This is a Do-It-Yourself, Self-Assembly kit that generally takes 2-8 hours to assemble based on end user skill level. With all of this said, we will be doing a video series on the build of this printer to help others follow along and see what this all about and if this right for you! So get a favorite beverage, kick back and lets watch some video!